Express your teacher appreciation and thanks through a favorite photo and this attractive Personalized Teacher Picture Frame. Fun personalized teacher gifts from your child after a long year of learning. An Engraved Favorite Teacher Photo Frame also makes for an unique teacher retirement gift as well. 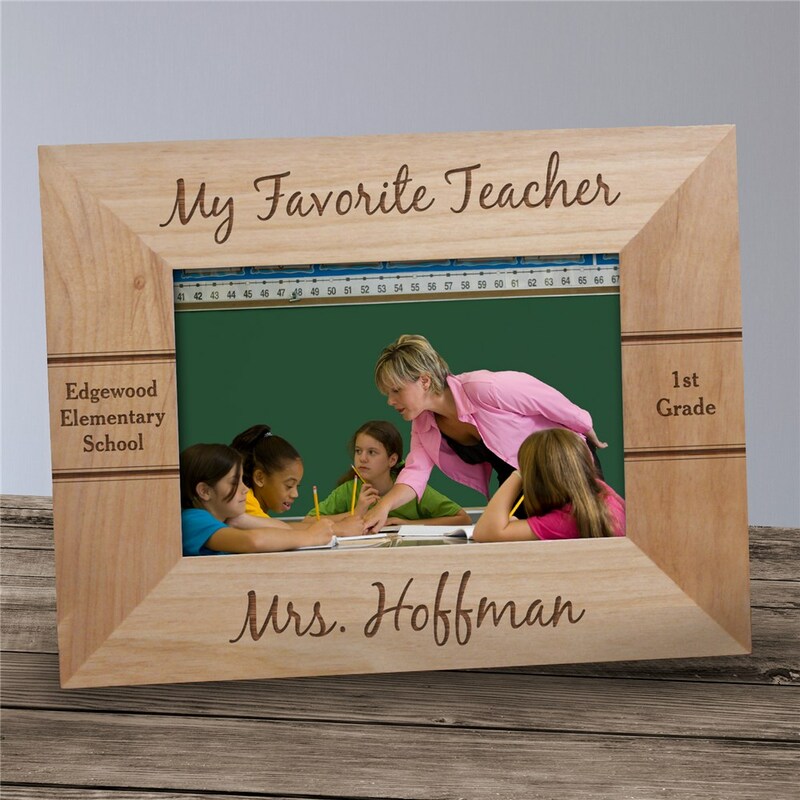 Our Personalized Teacher Wood Picture Frame comes in three sizes, please choose from, 4"x6, 5"x7" and 8"x10". Personalized Wood Picture Frame also includes an easel back for desk display. Your Personalized Favorite Teacher Appreciation Picture Frame includes FREE engraving! Personalize your Wood Photo Frame Gift with any teacher's name, school name and grade ( ie. Mrs. Hoffman / Edgewood Elementary School / 1st Grade ). Buy Personalized Gifts For Teachers Today! It was even better than I expected. It would be nicer if offered in 5x7 or 8x10 sizes. My son't Teacher loved it. Although, she had to cut down the class picture to put in it. Additional Details GiftsForYouNow.com has a wide selection of Personalized Teacher Gifts and Unique Teacher Appreciation Gifts. Make this the year you give your favorite teacher a gift above all others by giving a Personalized Teacher Gift from GiftsForYouNow.com.